Sources tell ESPN that Notre Dame and the Big East have reached an agreement allowing the Fighting Irish to leave the league two years early and join the ACC on July 1 of this year after paying a $2.5 million exit fee. Notre Dame's exit agreement with the Big East requires the Fighting Irish to provide 27 months notice and does not require an exit fee. 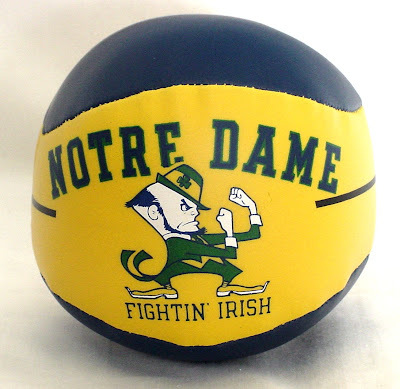 But the Fighting Irish and Big East agreed to the $2.5 million buyout of those terms. The Fighting Irish's move to the ACC will be official, pending the expected approval from the Big East's presidents in a Tuesday morning teleconference. The league is expected to announce Notre Dame's departure by noon Tuesday. Notre Dame announced last year it was joining the ACC in all sports except football. The ACC had been planning for months to accommodate Notre Dame if it was able to join for the 2013-14 academic year. The ACC already has formulated an 18-game, 15-team scheduling format for men's basketball. Notre Dame will play home and home ACC basketball games against Boston College and Georgia Tech along with two other ACC schools to be determined. Notre Dame also will play one game each against the league's remaining 10 members. Previously the Big East unsuccessfully tried to get Notre Dame to schedule future football games against Big East opponents to allow an early exit from the league, sources said. However, Notre Dame didn't have any future openings, in part, because of its football scheduling agreement with the ACC. Notre Dame, which will remain an independent in football, will play five ACC teams annually starting in 2014.